ORLANDO, Sept. 18, 2018 / Filta, the world’s restaurant kitchen and hospitality leader in active fryer management and environmental sustainability, announced today strong growth since the beginning of 2018, opening 10 new franchised units and signing 11 new franchise agreements to date. This momentum represents the brand’s expansion into top priority growth markets such as Pennsylvania, California, Iowa, Michigan, Oregon and Alaska, where the company added its first franchisee in the state. Fueled by the company’s robust support system designed specifically to lower franchisee barriers to growth, Filta is strategically positioned to achieve its development goals. 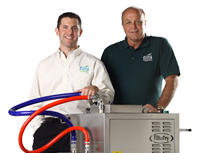 Since its inception, Filta has positioned itself as the groundbreaking founder of the active fryer management industry, which makes commercial kitchens safer, more efficient, and environmentally sustainable by micro-filtering existing cooking oil, providing bin-free waste oil collection, deep cleaning fryers, and recycling waste oil. Furthermore, the brand has expanded its kitchen services into humidity control for cold storage and grease-free drain foams making it a recognised environmental leader across the restaurant and hospitality industry. Through its network of thousands of commercial and restaurant kitchens that it services every week, Filta has recycled nearly 1 billion pounds of used cooking oil into bio-diesel, significantly reducing the impact of fryer oil on the environment. For more information about franchising with Filta, visit filtafryplus.co.uk/franchise.